The Royal Residential Halls in Dusit Garden used to be the homes of members of the royal family. Today, these buildings have been converted to museums preserving special aspects of Thai art, culture and royal mementos. When you visit Dusit Garden as part of your Bangkok city tour, make it a point to visit these museums as well. Here is a list of these Royal Residential Halls in Dusit Garden and what’s displayed inside. The first four buildings were the former homes of sisters of King Rama V. Each place displays a special aspect of Thai history and culture. · HRH Princess Arun-Wadi Residential Hall - royal photo collection by HM King Bhumipol during his visits to America and Europe. · HRH Princess Bussabun Bua-Phan Residential Hall - royal photo collection by HM King Bhumipol of his visits to various provinces in rural Thailand. · HRH Princess Orathai Thep Kanya Residential Hall - rare antique textiles woven during the reigns of King Rama IV and King Rama V.
· HRH Princess Puang Soi Sa-ang Residential Hall - rare collection of antique clocks used during the reign of King Rama V.
· Krom Luang Vorased Thasuda Residential Hall - the famous Ban Chiang collection, artefacts from a civilization that dates back to 3,600 BC. · Suan Bua Residential Hall - large collection of Buddha statues, old photographs in the reign of King Chulalongkorn and gifts presented to HM King Bhumibol on state visits. · Suan Farang Kansai Residential Hall - personal possessions of King Rama V and a collection of very old oil paintings some of which were gifts on his European visits in the late 19th century. · Suan Hong Residential Hall - photographs of royal ceremonies performed by HM King Bhumipol and HRH the Crown Prince are on display. · Tamnak Ho Residential Hall - 13th century Sukhothai pottery recovered from shipwrecks in the Gulf of Thailand. 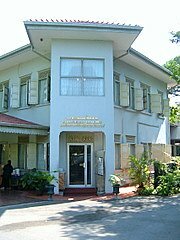 We start our tour of the Royal Residential Halls with the HRH Princess Arun Wadi Residential Hall, a small two-story brick house to the north of Vimanmek Mansion in Dusit Garden, just next to the Princess Bussabun Bua Phan Residential Hall. Princess Arun Wadi was one of the sisters of King Chulalongkorn or King Rama V who built this house and three others in Dusit Garden for his sisters. After the coup in 1932, this house went under military administration until 1989 when the government returned the property to the king. The former royal residence is now the King Bhumipol Photography Exhibition Hall I displaying the royal photo collection taken personally by King Bhumipol Adulyadej, the present king, who is an avid photographer. The photo exhibition in this royal residential hall reflects a different aspect of royal visits this time; visits to Belgium, England, Denmark, Netherlands, Sweden and the USA. The royal photo collection shows the skill of the photographer in capturing the moods of the subject at the crucial time and place with just the right exposure. This is particularly apparent in endearing photos of the Queen and the royal children in their younger days. There are rare photos of King Bhumipol on the saxophone with Benny Goodman and Louis Armstrong during the royal visit to New York. Some of the photos also reflect the sense of humor of the king, a great dog lover, when he snapped shots of dogs playing on musical instruments. The king is well known for his love for dogs. On another occasion, when confronted with a horde of photographers snapping furiously on their cameras, His Majesty coolly responded by taking a shot of them in return. The excitement and mood of the crowds in America and Europe on seeing the Thai royal family at close quarters for the first time are vividly captured in this collection of old photos. This royal residence, like the Princess Bussabun Bua Phan Residential Hall, provides an interesting visit for those keen in photography and gaining an insight into the lives of Thai royalty. HRH Princess Bussabun Bua Phan Residential Hall is a small two-story brick house tucked away in the northern edge of Dusit Garden, just north of the Vimanmek Mansion. Princess Bussabun was one of the sisters of King Chulalongkorn or King Rama V who built this house and three others in Dusit Garden for his sisters. After the coup in 1932, this house went under military administration until 1989 when the government returned the property to the king. The former royal residence is now the King Bhumipol Photography Exhibition Hall II displaying the photographs taken personally by HM King Bhumipol Adulyadej, the present king, during his field visits to the various rural provinces in Thailand. The photo collection reflects the keen interest taken by HM King Bhumipol in seeing rural problems at first hand and solving them. The photo exhibition on the ground floor of this royal residential hall is on royal projects dedicated to environmental preservation and irrigation. Numerous royal projects were also initiated to build dams, reservoirs and aqueducts for better water management in the agricultural sector. The photo collection gives the visitor an idea of the degree of royal involvement in the problems of the common people and also the extent of Thailand's geography. Like all good fathers, photos of the family are an essential part of the album. The royal family is no exception. Photos of the royal family taken by the king are displayed on the second floor. 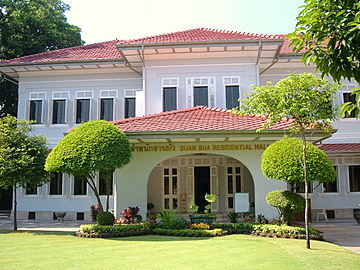 HRH Princess Orathai Thep Kanya Residential Hall is the fourth royal residential hall built by King Rama V for his sisters. This royal residence is located in the northern sector of Dusit Garden, Bangkok near the entrance in Rachawithi Road. This two-story brick building, slightly larger than the other three, has a rare collection of textiles used during the reigns of King Rama IV and King Rama V. The raw material for these fabrics were imported from China and Europe and woven by the royal household staff. The results are resplendent pieces of silk in gold and silver displayed in glass showcases. The silk pieces of this period are around 120 – 150 years old! It's a pity though, that some of these pieces haven't withstood the ravages of time. Slight tears and wrinkles are starting to show in a couple of pieces on display. Such fabrics are priceless and irreplaceable. In addition to the antique textiles, more contemporary pieces are on display here. These are products from the SUPPORT Foundation (the Foundation for the Promotion of Supplementary Occupation and Related Techniques) under the patronage of HM the Queen. These pieces are about 5 – 10 years old. In the room upstairs, the various designs of Thai formal ladies wear for day and evening functions are also illustrated. For more on the different types of Thai silk, please see Phrae Wa Thai silk and Mud mee Thai silk. 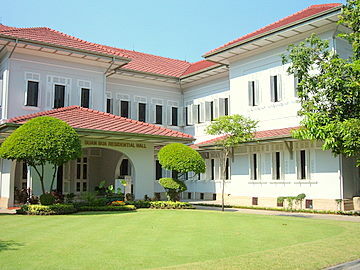 HRH Princess Puang Soi Sa Ang Residential Hall is a two-story brick house to the north of Vimanmek Mansion in Dusit Garden, in the same row as the other two residential halls that display the royal photographic collections. Princess Puang was another of the sisters of King Chulalongkorn or King Rama V who built this house and three others in Dusit Garden for his sisters. After the coup in 1932, this royal residence, like the rest in Dusit Garden, went through the ignominy of going under military administration. For a time, the residence was occupied by an army officer. In 1989 the government returned the property to the king. The ground floor of this residential hall has on display a collection of 19th century antique clocks some of which were made to order for King Rama V. The collection includes antique grandfather clocks, mantel clocks from England, Germany and the USA. By the stairs, there's even an antique clock set in an old artillery casing! The rooms upstairs display the art collection, royal gifts and souvenirs of King Rama V. These include an Italian marble vase, the renowned Benjarong ceramics, woodcarvings and brassware of that period. Of particular interest would be the doll room with life-sized models of dolls in the national costumes of various countries in Europe and Latin America. 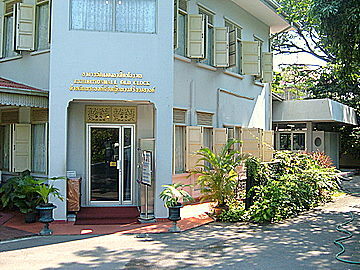 Krom Luang Vorased Thasuda Residential Hall is a small brick building near the northern wall of Dusit Garden. This modest building was the home of Princess Bootri, a daughter of King Rama III. She raised Princess Phra Thepsirin, mother of King Chulalongkorn or King Rama V.
King Rama V, who considered Princess Bootri as his grandmother, built this home for her in Dusit Garden. There's another special aspect of this residential hall. It houses the famous Ban Chiang artefacts from a civilization that dates back to 3,600 BC! Ban Chiang, a prehistoric agricultural settlement, existed between 3,600 BC – 200 AD. This pre-historic settlement is located at Ban Chiang, Amphur Nong Han, in eastern Udon Thani about 550 km from Bangkok. The artefacts at Ban Chiang include iron and bronze tools, glass, shell and stone objects and the famous Ban Chiang ceramics. These ceramics have their characteristic spiral designs painted in red on the surfaces. 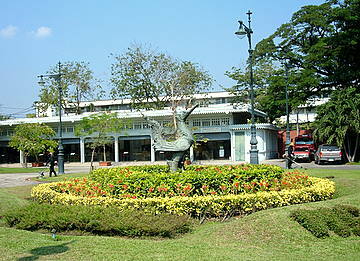 Ban Chiang was designated a UN World Heritage Site in 1992. This civilization, which stands among the ancient Egypt, Stonehenge and the Indus Valley civilizations, was discovered in 1966 by accident by Stephen Young, son of former US Ambassador to Thailand. It's considered the most important prehistoric site in South-East Asia. The only other place in Bangkok that displays these artefacts is the Chumbhot-Pantip Arts Center in to the Suan Pakkad Palace Museum. 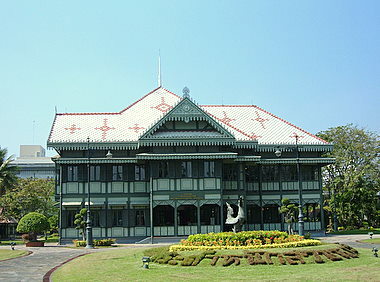 Suan Bua Residential Hall located on the eastern sector of Dusit Garden was the former residence of Princess Saisavali Bhiromya, a favorite consort of King Chulalongkorn. Skilled in the culinary arts, she was also responsible for supervising the preparation of the king's meals. In the reign of King Chulalongkorn, this two story white building was where the king's meals were prepared. In 1999, the Royal Household Bureau refurbished this residential hall and converted it to a museum displaying Buddha statues, old photographs from the reign of King Chulalongkorn and paintings presented to HM King Bhumipol on state visits. On the walls hang old faded photographs of Emperor Wilheme of Germany, King Baldwini of Belgium, Emperor Mary of Russia and Queen Maud of Norway, King Chulalongkorn in Egypt in 1897, the royal family's visit to Austria, priceless relics from the reign of King Chulalongkorn. This royal residential hall has several rooms and niches where numerous Buddha statues are displayed. The inner room on the ground floor has a large collection of golden Buddha statues in glass cases. The room however is cordoned off and the statues can only be viewed from the outside. Over the arched entrance hang paintings of the nine Chakri kings. The rooms upstairs display more statues of Buddha, famous Buddhist monks, Chinese and Hindu deities. There must be at least 400 of such statues of various sizes in this royal residential hall. Unfortunately, visitors are limited to viewing from the corridor as the rooms are cordoned off. The place with reputedly the biggest collection of Buddha statues is the Museum of Buddhist Art with works dating back to the 6th century AD. Suan Farang Kangsai Residential Hall displays some of the personal possessions of King Chulalongkorn and oil paintings that are more than 100 years old. The building, completed in 1909, has been immaculately restored and maintained. It was the former residence of a consort of King Chulalongkorn, Phra Raja Jaya Dara Rasmi, and the daughter of the Prince of Chiangmai. The union was also to contribute to the merger of the northern Lanna kingdom with the rest of Thailand. Displays downstairs consist of pottery used by royalty, washing basins, water jugs and even chamber pots made to order from England and Germany with the royal insignia of King Chulalongkorn imprinted. China, a favorite pottery with the Thai royalty, is ever present. So is Benjarong pottery designed in Thailand and made in China. 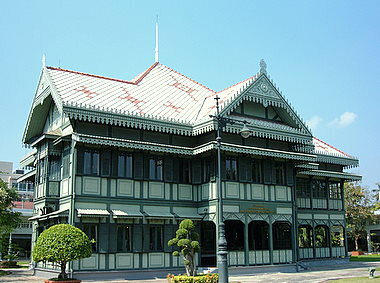 Suan Farang Kangsai Residential Hall also displays old oil paintings of King Chulalongkorn, princes from King Rama II and King Rama III, including European oil paintings presented to King Rama V during his European tour in 1897. As these painting are more than 100 years old, some are starting to show signs of age. Thankfully, there's ongoing program by the Fine Arts Department to restore these oils. Some paintings have been removed for restoration. The wide assortment of royal possessions includes old European oil lamps, French vases, Chinese paintings and food containers, an Italian mirror and animal horns and tusks presented as gifts to King Chulalongkorn. Rooms upstairs display equipment used in the elaborate royal cremation ceremony as well as royal sedan chairs for carrying royalty around in that period. The old brass drum to announce the arrival of royalty is still there. Suan Farang Kangsai Residential Hall preserves some of the personal articles used by royalty in their daily lives and in death. Suan Hong Residential Hall a traditional two story wooden building, is the first residential hall a visitor passes on entering Dusit Garden through the northern gate. Suan Hong or Swan Garden, named after the legendary swan that is the steed of Brahma, was the residence of Queen Savang Vadhana, grandmother of King Rama V.
The visitor passes a beautifully kept lawn before entering the residential hall where photographs of royal ceremonies performed by HM King Bhumipol and HRH the Crown Prince are displayed. In the balcony are two scaled models of the entire Dusit Garden palace grounds and buildings. Rows of mannequins dressed in the traditional royal court uniforms line the hallway downstairs. The majestic Royal Barge Procession is depicted in the room downstairs with elaborate models and pictures of the various royal barges used in the Royal Barge Ceremony. A video in the background records the last Royal Barge Procession in October 2003, when the royal barges sailed down the Chao Phraya River to honor the world leaders attending the APEC Conference in Bangkok. The first room upstairs displays the Royal Ordination Ceremonies of HM King Bhumipol and HRH the Crown Prince. Photographs show HM King Bhumipol ordained as a monk in 1956, an important event in the lives of all Thai males. HM King Bhumipol has his head shaven by the Princess Mother, enters the monkshood and collects alms like any other monk. The second room displays photographs of the Royal Ploughing Ceremony to mark the start of the agricultural year. The royal oxen are brought out to Sanam Luang for a ceremonial ploughing and thanksgiving to Mother Nature. Seeds are symbolically sown and later distributed to the farmers. Other photographs include the Royal Swing Ceremony, Royal Investiture Ceremony and Royal Tonsure Ceremony when the topknot is shaved off. Tamnak Ho Residential Hall is the last of the royal residential halls in our tour of Dusit Garden. This residential hall was originally built in the Bang Khun Phrom Palace grounds, the present premises of the Bank of Thailand. The residence was built in 1903 for Prince Paribatra Sukhumbandhu, Prince of Nakon Sawan, a son of King Chulalongkorn, as a wedding home. Hence the name "Home for the Newlyweds." When the Bank of Thailand took over the Bang Khum Phrom Palace grounds, the residence was moved to the Sukhothai palace grounds in 1985. In 1998, HM King Bhumipol, the present king, had the building dismantled and rebuilt in Dusit Garden. Bang Khum Phrom Palace is currently the Bank of Thailand Museum. The main attraction of this royal residence is the display of old pottery from the Sukhothai period around the 13th – 14th centuries. These relics were recovered from underwater shipwrecks in the Gulf of Thailand off the coast of the eastern provinces of Rayong and Chantaburi in 1976. The Underwater Archaeological Section of the Fine Arts Department has identified 25 such sites in the Gulf of Thailand. Most of the wrecks are off the coast of Rayong and Chantaburi near the Cambodian border. Some are off the coast of Nakhon Sri Thammarat to the south in peninsula Thailand. 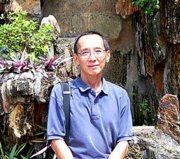 It is believed that the wrecks were that of old Chinese and Vietnamese junks plying the sea routes in the 15th – 18th centuries. For more on Sukhothai pottery and the underwater treasures recovered, please see Ancient kilns of Si Satachanalai and Sawanvoraknayok National Museum both of which are in Sukhothai. Other displays in the residential hall are the personal effects of Queen Rambhai Bhanee, a consort of King Rama VII or King Prajadhipok. Tamnak Ho Residential Hall, sited in three locations in its 100-year history, preserves the legacy of relics from an era that's more than 800 years old. And that brings us to an end to the tour of the Royal Residential Halls In Dusit Garden. Opening hours for the royal residential halls are the same as for Dusit Garden, every day from 09:30 am – 03:15 pm. Admission to these royal residential halls is included in the admission ticket to Dusit Garden which is 100 baht. No photographs are allowed inside the residential halls. To return to Dusit Garden. We regret to inform readers that with effect from 11 August 2017, the Ananta Samakhom Throne Hall, Dusit Garden and all the Royal Residential Halls within will no longer be open to the public.